TOPS - Tahoma Field Knife Single Edge. Model TPTAHO02. 13 15/16" overall. 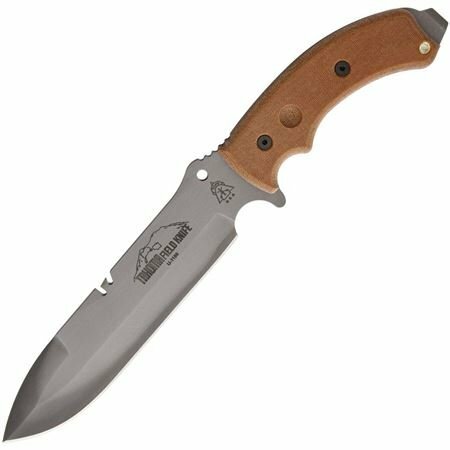 8 1/2" black river wash finish 1095 high carbon steel blade with wire breaker notch on spine. Tan canvas micarta handles with steel guard and pry bar pommel. MOLLE compatible black ballistic nylon sheath with removable plastic insert, small outer pouch and cord lanyard with emergency safety whistle.